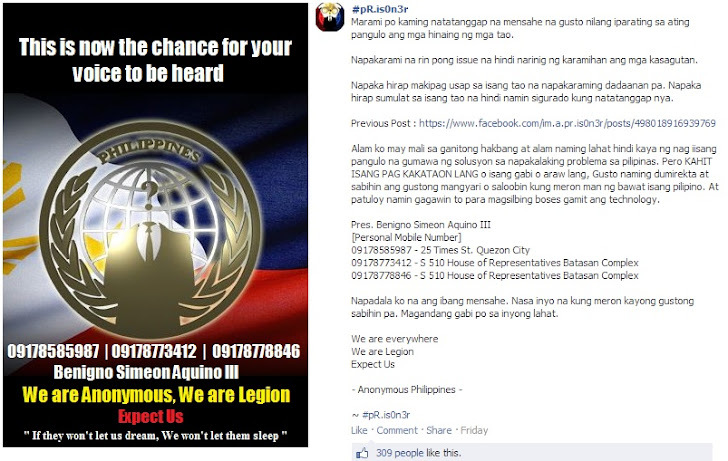 A Philippine Anonymous hacker "#pR.is0n3r" has posted the President Benigno Aquino’s three personal mobile telephone numbers online on facebook. Officials would not confirm if the numbers were really the President’s. Hacker urged his 10,000 followers to communicate directly with their president, but the numbers are no longer working. “The majority are not getting answers to so many issues. It is difficult to speak to a person through go-betweens. If we send him a letter we’re not even sure he will receive it,” Hacker wrote in facebook post. In March 2013, Anonymous Hackers also defaced the Philippines President's website and other dozen government websites.